The original byre of Winkston Farm has been carefully converted to a particularly high standard and quality to form two charming self-catering cottages on the outskirts of Peebles. Very special care has been taken to retain the original character of the whin-stone building. Tasteful decoration and comfortable furnishings with continuous upgrading providing luxury accommodation for up to four people in each cottage. Downstairs, each cottage has an open plan lounge/dining and kitchen area as well as a toilet and shower room. The bedroom has zip and link beds so you can have twin beds or a King sized bed. From the lounge area a spiral staircase leads to a minstrel gallery and second sleeping area with twin beds or a Kings sized bed again zip and link. 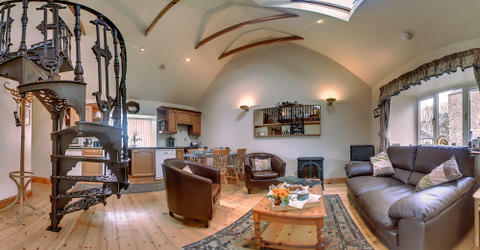 Take a look around our holiday accommodation with our new interactive virtual tour. Click on the image to open a new window and explore! Sorry – our cottages are non-smoking accommodation and are unsuitable for pets. We have GONE GREEN – in our attempts to help the enviroment we’ve found the installation of £1 coin meters to be the most efficient way to do this. The meters are simple to use and are charged at the usual house hold rate. Christmas and New Year £620 per week including a hamper full of goodies and cottages seasonally decorated. Off Season short break rates available. For more details, special requests, latest deals and special offers, Please phone us – we do try to be flexible.